In 1959 the film 'Carry on Sergeant' was partially filmed at Stoughton Barracks, causing much amusement to the recruits and permanent staff alike, and headaches for the RSM (RSM H Atkins). 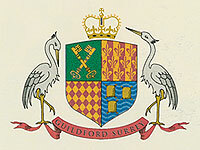 In 1959 it was announced by The Government that further amalgamations were to take place and The Queen's Royal Regiment and The East Surrey Regiment were to amalgamate. 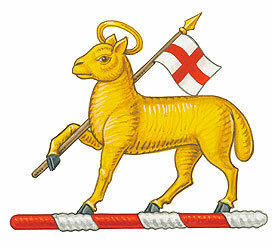 Thus the two Infantry Regiments of Surrey came together and became The Queen's Royal Surrey Royal Regiment. The Queen's Royal Regiment left Stoughton Barracks in 1959. Subsequently it was used as a Pay Office and Records Office and an Army Works Study Team Centre. 1983 saw the last military occupants leave the barracks. Planning application for outline planning permission for residential development of the 17.9 acre site submitted to GBC by agents, Knight, Frank & Rutley. This proposed 190 dwelling units on 13.6 acres and also 4.3 acres of community space, plus new access from Stoughton Road - but with The Keep, Officers' Mess and Barrack wall retained. News published that a 'Stoughton Barracks Conservation Area' has been designated by Guildford Council to protect the southern part which comprises most of the original 1870s buildings. From 1983 to 1993 the barracks remained disused and largely derelict. Still owned by the Ministry of Defence, various proposals were put forward for its further use. Eventually in 1993 the barracks was sold to Countryside Properties Plc with outline planning permission to develop the 18 acre site for residential use, with a new access entrance in Stoughton Road, whilst retaining many of the features of The Keep, officers' mess, some of the accommodation blocks and retaining the brick barrack wall and arch facing on to Stoughton Road. It was announced that the new development would be named Cardwells Keep. 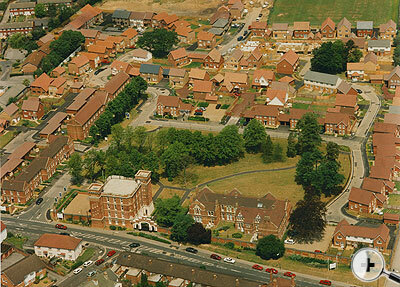 An aerial view showing the new layout of housing. The Keep, officers mess to the front of picture and to the left the QHS & RSM's Quaters with Orderly Room in the centre. Peterborough Barrack block can also be seen.